The goal of business identity signage is to capture the attention of prospective customers and give them their first branding association with the business. Usually located near the passing street that is most closely associated with the entrance to the business, having visible business signage assures customers that they have reached their destination and provides wayfinding for parking and access. When looking for signage for a new location or to update existing signage, you should consider all of your options. 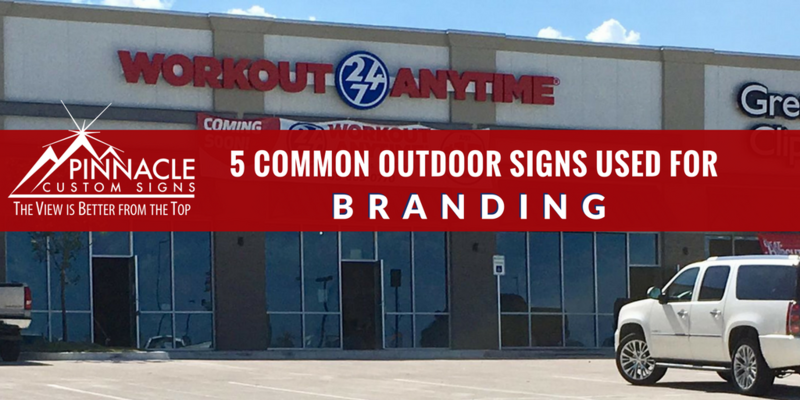 Here are the 5 most common types of outdoor signage to consider. When you think about outdoor signage, monument signs most typically come to mind. 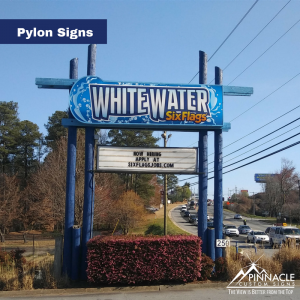 Monument signs are free standing outdoor structures used to designate the entrances of retail centers, corporate locations, housing developments or subdivisions, medical centers, churches, schools, and any type of organization with a physical space. These signs are designed to be eye catching, impact others visually and correlate with the architecture of the building. They provide signage to express the business. They are designed and crafted with a variety of durable and often innovative materials designed specifically for long term out door use. The faces for these structures can include wood, stucco, brick, stone, or any type of surface to match the style of the building. 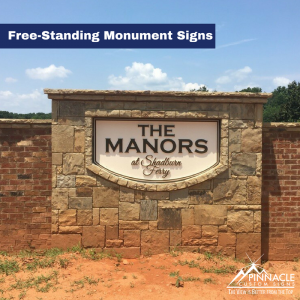 However, the bases of these signs are created from structured and long-standing materials to provide solidity such as stone and brick to prevent erosion. Free-standing signs can be illuminated from inside the cabinet or by external flood type lights to aid in visibility at night. Post and panel signs can be used for both single and multi-tenant structures. Like the free-standing signs above, they are typically made with wooden posts but can be made of a variety of materials. These signs are typically simple and two sided but can be made with elaborately carved and painted wood panels for upscale properties. Choice of style, color, and graphics can aid in making post and panel signs stand out that aid in brand recognition. By adding additional external lighting to these signs, they can be visible during night hours. Outdoor channel letters are one of the most frequently used outdoor signs. Channel letters are 3-D signs or letters fabricated from aluminum, acrylic, or similar materials and can include LED or Neon lighting. These signs are commonly used on the exteriors of building in malls, strip centers, or on other large buildings. 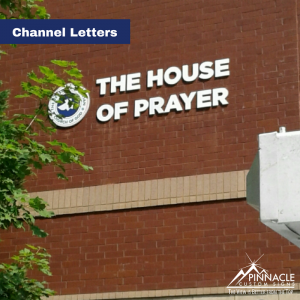 Channel letters can also be found inside malls to identify each individual store or inside office parks as lobby signs to identify different office locations within the building. Channel letters offer some of the best visibility for businesses as each letter is often 12″ or taller and can be internally illuminated which increases night visibility. It is easy to make a very large sign out of channel letters as each letter is generally an individual unit pieced together to make the whole sign. Large free-standing pylon signage typically uses a single sign cabinet set atop a pole or positioned between two tall poles to create maximum visibility. 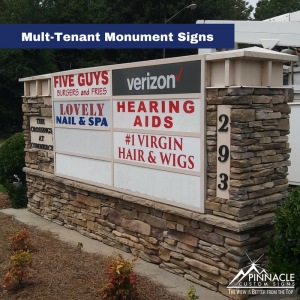 These signs can support multiple tenants or a single location. Pylon signs are often placed high off the ground to attract pedestrian and driver’s attention from a greater distance. They are usually internally illuminated within the cabinet to attract consumers throughout the day. If you have a location on a pylon sign within a multi-tenant panel, keep your section of signage simple with highly contrasting letters. Multi-tenant panels may often require using a basic variation in order to gain maximum visibility. 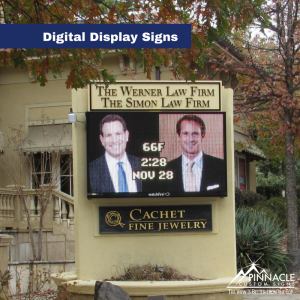 Outdoor signs with a digital display are one of the fastest growing types of signage. These signs provide a greater control of messaging in contrast to the free-standing signage mentioned before. Digital display signs provide both branding and important messages about current or upcoming promotions by allowing the owner to update the call to action and messaging through computerized control. The illumination and movement make them impossible to miss. These signs can be used for entertainment centers, schools, retail locations, churches, and governments other organizations with a dedicated location and need to promote offers or events. Regardless of the type of outdoor signage you choose, it can be custom designed to fit the architecture and signage code of the municipality of your location. Outdoor signage can come in all shapes, sizes, styles and forms, so don’t feel like you have to pick a boring, standard look. Signs can be fabricated from many different types of materials, some of which can mimic natural materials while providing greater durability. If you are looking for business signs for a new location or considering replacing the existing signage, make sure that you consider all your alternatives. When you consider how a consumer will find your location, you can make the most informed decisions about your company’s outdoor signage and branding needs. The team is here at Pinnacle to help guide you through those decisions and any regulations you may encounter in the process. Give us a call for a free consultation about your business or organizations outdoor signage needs or contact us through our site today.